This book is a collection of famous or historic bridge hands played by some of the best or most famous players in the world at that time. It is not intended to be a book of basic instruction. The authors are masters at both chess and bridge. Chess books often consist of the best games played by this or that player, such as "Alekhine's Best Games of Chess" for example. This book is in that style except that it is a collection of the best or most famous hands in Bridge. Robert Burger and Guthrie McClain first noticed a strong connection between bridge and chess when they brought international chess grandmasters to San Francisco to give exhibitions. Some of the most famous names in chess seemed to prefer bridge as their favored recreation away from the chessboard. Guthrie McClain (1910-1991), a bridge life master since the late 1930s, competed in tourneys with his wife for many years, and later with Henry Gross, the famed proprietor of the Barton Bridge Studio in San Francisco and also a chess master. They took up every game, from go to bridge, and became masters at most of them. Robert Burger partnered with McClain in founding the California Chess Reporter, the major chess publication on the West Coast for 25 years from 1951 to 1976. They decided to create "Pro Bridge" as a potential series of books that would bring the historic masterpieces of the game to the average player, in much the same way as the great chess collections had done for the "Royal Game". The result is a book that the reader can browse for many pleasures: the great coups of historic games, the insights into the playing styles of the masters, and quirks and anecdotes that make bridge the sociable game it is. Will it improve your game? Only if you use this snapshot of history as an incentive to learn, not by rote, but by fascination with the creativity of the greats of bridge. Robert Burger is especially noted for one chess game, his win against Bobby Fischer in 1964. Robert Burger was at one time the strongest chess player in Northern California and one of the strongest in the United States. A National Master, Burger also has the distinction of being a grandmaster of chess composition, of the U.S. Chess Problem Society. He is also a Fellow of the British Chess Problem Society and the author of numerous nonfiction books. Among his other chess books are "Grandmaster Chess" and "The Unknown Tal." He has reported on chess tourneys and matches throughout Europe. Among his collaborators on chess books have been Isaac Kashdan and Vladimir Nabokov (yes, that one!). Guthrie McClain (1910-1991), a bridge life master since the late 1930s, competed in tourneys with his wife for many years, and later with Henry Gross, the famed proprietor of the Barton Bridge Studio in San Francisco and also a chess master. They took up every game, from go to bridge, and became masters at most of them. 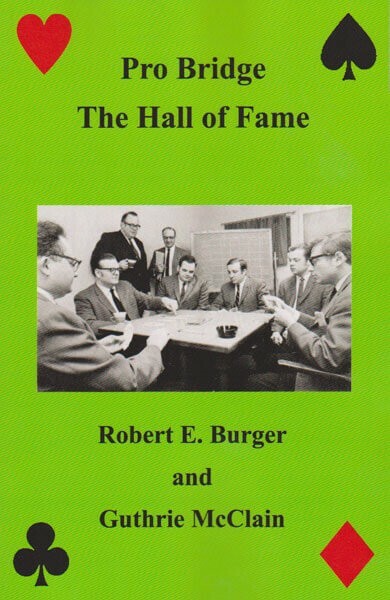 Robert Burger partnered with McClain in founding the California Chess Reporter, the major chess publication on the West Coast for 25 years from 1951 to 1976.